The acorn is the fruit of oaks. It is a nut, containing a single seed (rarely two seeds), enclosed in a tough, leathery shell, and borne in a cup-shaped cupule. Acorns vary from 1-6 cm long and 0.8-4 cm broad. Acorns take about 6 or 24 months (depending on the species) to mature. Acorns are one of the most important wildlife foods in areas where oaks occur. Creatures that make acorns an important part of their diet include birds such as jays, pigeons, some ducks and several species of woodpeckers. Small mammals that feed on acorns include mice, squirrels and several other rodents. Large mammals such as pigs, bears and deer also consume large amounts of acorns; they may constitute up to 25% of the diet of deer in the autumn. In some of the large oak forests in southwest Europe, pigs are still turned loose in oak groves in the autumn, to fill and fatten themselves on acorns. However, acorns are toxic to some other animals, such as horses. In some human cultures, acorns once constituted a dietary staple, though they are now generally only a very minor food. The larvae of some moths and weevils also live in young acorns, consuming the kernels as they develop. Acorns are attractive to animals because they are large and thus efficiently consumed or cached. Acorns are also rich in nutrients. Percentages vary from species to species, but all acorns contain large amounts of protein, carbohydrates and fats, as well as the minerals calcium, phosphorus and potassium, and the vitamin niacin. Total food energy in an acorn also varies by species, but all compare well with other wild foods and with other nuts. Acorns also contain bitter tannins, the amount varying with the species. Since tannins, which are plant polyphenols, interfere with an animal's ability to metabolize protein, creatures must adapt in different ways to utilize the nutritional value that acorns contain. Animals may preferentially select acorns that contain fewer tannins. Creatures that cache acorns, such as jays and squirrels, may wait to consume some of these acorns until sufficient groundwater has percolated through them to leach the tannins out. Other animals buffer their acorn diet with other foods. Many insects, birds and mammals metabolize tannins with fewer ill-effects than humans. Several humans cultures devised acorn-leaching methods that involved tools, and that could be passed on to their children. Species of acorn that contain large amounts of tannins are very bitter, astringent, and potentially irritating if eaten raw. This is particularly true of the acorns of red oaks. The acorns of white oaks, being much lower in tannins, are nutty in flavour, which is enhanced if the acorns are given a light roast before grinding. Tannins can be removed by boiling chopped acorns in several changes of water, until water no longer turns brown. Being rich in fat, acorn flour can spoil or get mouldy easily and must be carefully stored. Acorns are also sometimes prepared as a massage oil. Acorns, being too heavy to blow in wind, do not fall far from the tree at maturity. Because of this, oaks depend on seed dispersal agents to move the acorns beyond the canopy of the mother tree and into an environment in which they can germinate and find access to adequate water, sunlight and soil nutrients, ideally a minimum of 20-30 m from the parent tree. 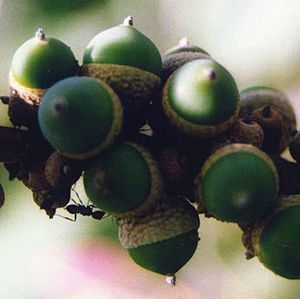 Many acorn predators eat unripe acorns on the tree or ripe acorns from the ground, with no reproductive benefit to the oak. However, some acorn predators also serve as seed dispersal agents. Jays and squirrels that scatter-hoard acorns in caches for future use, effectively plant acorns in a variety of locations in which it is possible for them to germinate and thrive. Although jays and squirrels retain remarkably large mental maps of cache locations and return to consume them, the odd acorn may be lost, or a jay or squirrel may die before consuming all of its stores. A small number of acorns manage to germinate and survive, producing the next generation of oaks. Scatter-hoarding behaviour depends on jays and squirrels associating with plants that provide good packets of food that are nutritionally valuable, but not too big for the dispersal agent to handle. The beak sizes of jays determine how large acorns may get before jays ignore them. 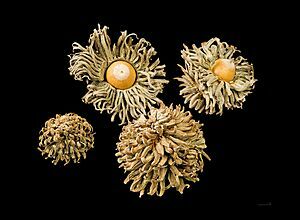 Acorns germinate on different schedules, depending on their place in the oak family. Once acorns sprout, they are less nutritious, as the seed tissue converts to the indigestible lignins that form the root. Acorns appear only on adult trees, and thus are often a symbol of patience and the fruition of long, hard labour. 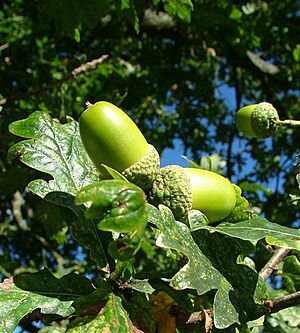 For example, an English proverb states that Great oaks from little acorns grow, urging the listener to wait for maturation of a project or idea. A German folktale has a farmer try to outwit Satan, to whom he has promised his soul, by asking for a reprieve until his first crop is harvested; he plants acorns and has many years to enjoy first. In Britain, one old tradition has it that if a woman carries an acorn on her person it will delay the aging process and keep her forever young. In the United States, botanists joke that even the greatest oak was once a little nut. 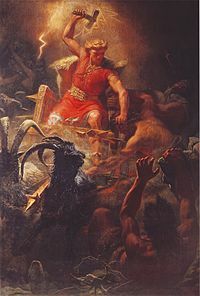 The Norse legend that Thor sheltered from a thunderstorm under an oak tree has led to the belief that having an acorn on a windowsill will prevent a house from being struck by lightning, hence the popularity of window blind pulls decorated as acorns. In ancient Japan, (Jomon period), acorn was an important food. They harvested, peeled and soaked acorns in natural or artificial ponds for several days to remove tannins, then processed it to make acorn cakes. In Korea, an edible jelly named dotorimuk is made from acorns. A motif in Roman architecture and popular in celtic and scandinavian art, the symbol is used as an ornament on cutlery, jewelry, furniture, and appears on finials at Westminster Abbey. The Gothic name akran, German Eicher, etc., had the sense of "fruit of the unenclosed land". The word was applied to the most important forest produce, that of the oak. Chaucer spoke of "achornes of okes" in the 1300s. By degrees, popular etymology connected the word both with "corn" and "oak-horn", and the spelling changed accordingly. In the 1600s, a juice extracted from acorns was administered to habitual drunkards to cure them of their condition or else to give them the strength to resist another bout of drinking. Young lovers may place two acorns, representing themselves and the object of their affection, in a bowl of water in order to predict whether they have a future together; if the acorns drift towards each other they are certain to marry (they will, if placed closer to each other than to the edge of the bowl). By analogy with the shape, in nautical language, the word acorn also refers to a piece of wood keeping the vane on the mast-head. Acorns were a traditional food of many indigenous peoples of North America, but served an especially important role in California, where the ranges of several species of oaks overlap, increasing the reliability of the resource. Acorns, unlike many other plant foods, do not need to be eaten or processed immediately, but may be stored for long time periods. In years that oaks produced many acorns, Native Americans sometimes collected enough acorns to store for two years as insurance against poor acorn production years. After drying them in the sun to discourage mold and germination, Indian women took acorns back to their villages and cached them in hollow trees or structures on poles, to keep acorns safe from mice and squirrels. These acorns could be used as needed. 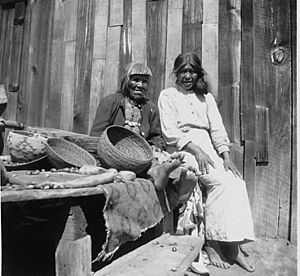 Storage of acorns permitted Native American women to process acorns when convenient, particularly during winter months when other resources were scarce. Women's caloric contributions to the village increased when they stored acorns for later processing and focused on gathering or processing other resources available in the autumn. Women shelled and pulverized those acorns that germinate in the fall before those that germinate in spring. Because of their high fat content, stored acorns can become rancid. Molds may also grow on them. Nevertheless, a rancid, moldy acorn looks tasty when no other food is available. Native North Americans took an active and sophisticated role in management of acorn resources through the use of fire, which increased the production of acorns and made them easier to collect. Diagram of the anatomy of an acorn: A.) Cupule B.) Pericarp (fruit wall) C.) Seed coat (testa) D.) Cotyledons (2) E.) Plumule F.) Radicle G.) Remains of style. Together D., E., and F. make up the embryo. Sprouting acorn of Quercus robur. Acorns from small to large of the Willow Oak, Quercus phellos (very small, at center); the Southern Red Oak, Quercus falcata; the White Oak, Quercus alba; and the Scarlet Oak, Quercus coccinea; from southern Greenville County, SC, USA. Scale bar at upper right is 1 cm. Copper acorns at the Peace Palace, The Hague. Acorn Facts for Kids. Kiddle Encyclopedia.